Specially designed and contoured to fit the JANE MATRIX LIGHT 2 / iMATRIX when in carrycot mode. This mattress is light, breathable and fits snugly inside your Matrix to provide a soft comfortable place for your baby to sleep. Warning: Only use this mattress when using the Matrix Light 2 as a carrycot for sleeping and not when using the product in your car as a car seat or lie flat car seat. My smartest buy ever -our baby just loves to sleep in the matrix, thanx to this cool and comfortable mattress! He even prefers it from his baby-cot. It's also easy to clean (I just put the outside cover in the washing machine). Hi, I'm a little bit confused how to use the mattress. In the middle picture the mattress is used in another carrycot? Where does the white border/bumper come from? I also wonder, where do the straps and buckle go when I place the mattress? The mattress is pretty soft and thin, so the straps will feel through it if I leave them under and the buckle will be somewhere by the baby side – I can't avoid it. Should I also take out the removable inset before placing the mattress? Jane UK Replies: Good Morning Natalya, Thanks for getting back in touch, hopefully I can help! The (middle) picture is a little deceiving I will admit - as its a picture of the Jane Transporter carrycot and not actually a Matrix Light II. We don't actually have a photo (yet) of the Matrix light 2 mattress actually in a Matrix Light 2! But - to clarify - this mattress is designed specifically to fit inside the new Matrix Light 2. The new Matrix is slightly shaped inside so the old mattress didn't fit very well, that's why they made this new version. So if you have a Matrix Light 2 you need this specific mattress for a perfect fit. The harness straps on the matrix can simply be tucked up inside the fabric covering the base/shell of the carseat in the side walls of the Matrix. Some people so tuck it under the mattress and flatten them out, its entirely up to you. But this is our best selling car seat ever and we have yet to have a single complaint from any customer of the mattress not being padded enough or the straps being uncomfortable for the little one. You can take out the inset/headhugger before inserting the mattress that will ensure the baby has a flat surface to sleep on. But the inset isn't physically connected just held by Velcro, you can just take it out when your using the Matrix as an overnight sleeper. I hope that helps! Hi, is this recommended for occasional overnighting or can this (mattress with a Matrix light 2) be used instead of a Moses basket for Baby's first few weeks/months or a week long stay with relatives for example? Jane UK Replies: This Mattress is actually a safety mattress with ventilation holes and a removable washable cover designed to fit the Jane Matrix Light perfectly. This mattress can be used for overnight sleeping, just like you would use a ordinary carrycot, Moses basket or crib. There is no problem with using it all the time. If baby is sick, just remove the cover and give it a wash. Hope this helps. Hi, I have the old Matrix light (version 1) and need a new mattress, will this fit? Thanks! Jane UK Replies: Hi Joanne, yes this will fit the Matrix Light, and Matrix Light 2 versions. Jane UK Replies: This safety mattress accessory is for use when Matrix is a carrycot or crib in the house or on the pram. When you use Matrix as a car seat, in either the lie-flat or sitting upright positions, you need to use the 5 point safety harness on the Matrix. The padding or seat liner is what you would use in this scenario, as the safety mattress can not work with the harness, unlike the Matrix seat padding / liner, the safety mattress has no holes in it for the harness straps to pass through. Hope this helps. Jane UK Replies: Hi Maria, Yes this mattress will fit the iMatrix i-Size as well and the Matrix Light 2 version. Do I need to remove the original padded seat liner prior to installation, or does it simply fit on top? Jane UK Replies: Hi Dave, When using the Matrix in the car as a car restraint system you must always use the safety harness for baby's protection. It is also advised to use the harness when using the Matrix on the pushchair as part of a travel system. If however, when using the Matrix as a carrycot for sleeping overnight, for example in the home and NOT when in the car or on the pram, you can use it in conjunction with the official Matrix Safety Mattress. It is recommended, to maximise the depth of the Matrix carrycot, it's best to remove the padded seat liner and open the harness out. Then place the official Matrix Safety mattress on top of the harness. It is thick enough that the baby won't feel the harness that is below the mattress. 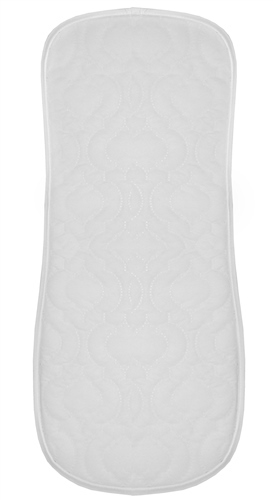 The Official Matrix Safety Mattress is designed to allow baby to sleep just as they would in a Moses basket or crib. However, please remember when using the Matrix in the Car or on the pushchair to use the safety harness provided.